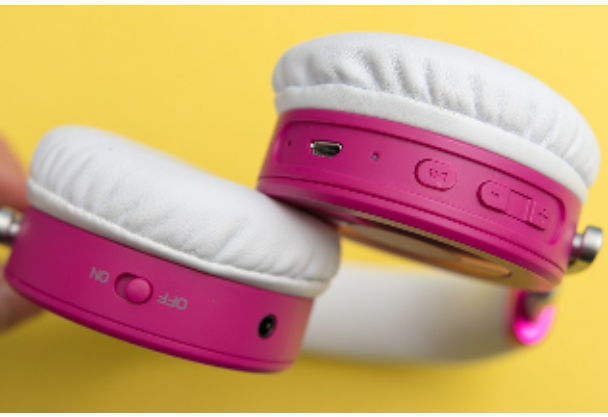 When you look at a pair of headphones that have been created specifically for school classroom use, the first thing you may notice is its oversized, almost clunky appearance compared with sleeker models not designed for use by school-age children. This is done on purpose- the design is intended to maximize the durability and ruggedness of the headphones. If you think about it, a single pair of headphones will be used multiple times, by multiple children per day in a typical school classroom with 25 students. Having several students put on and take off the headphones each day could cause stretching of the headband if they weren't designed for above-average wear and tear. Also, since most school-age children are not exactly known for their careful handling of school property, you can expect the headphones to be dropped, yanked, and sat on by students more than a couple of times over the course of the school year. This type of usage could make standard headphones break pretty quickly, which makes it essential for schools to invest in education headphones that can withstand a beating. Administrators, teachers and other school personnel face the challenge of purchasing quality supplies while adhering to a meager school budget. In order to maximize the return on an investment, it is vital to make sure that the product being purchased is of high quality and guaranteed to last for many school years to come. For this reason, it is necessary to purchase special education headphones designed for school classroom use. Because manufacturers of these special headphones understand their specific applications, they are able to ensure that each pair delivers the highest-possible grade of performance in the most important areas. Manufacturers of education headphones also tend to price their products with the typical school budget in mind, with many dealers offering bulk purchasing options to further increase affordability. This gives schools a chance to minimize their overall spend without compromising the quality of their students' education headphones. Naturally, it's possible to use just about any type of headphones for school classroom purposes, but teachers and administrators who choose not to purchase headphones specially designed for school-age children risk poor quality, high pricing, and much less durability for their investment. By choosing headphones specially-designed for school classroom use, school administrators and educators can rest assured that their purchase will last for many school years,and will deliver outstanding quality and incomparable learning performance.